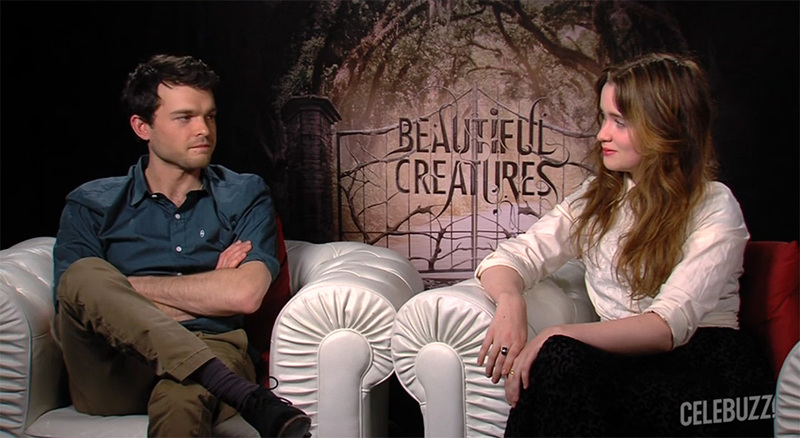 From what I can see by the trailers and clips and featurettes, actors Alice Englert and Alden Ehrenreich, who play Lena and Ethan respectively, seem to get along pretty, pretty well. Considering that they play teens in love with each other, that’s one of the things casting directors look for when dealing with the romantic aspect of a relationship. However, knowing that Alden was actually a last minute replacement, it truly is nice to see that they do get along. In the video below, they talk about their first meeting and the respect they have for each other. In Beautiful Creatures, Alden Ehrenreich and Alice Englert play Ethan Wate and Lena Duchannes, a restless Southern teenage boy and the girl he hopes will help him escape the boredom of small-town life. Sounds a little bit like a certain supernatural romance between a introverted schoolgirl and a shiny, impossibly good-looking vampire, no? According to the story, their characters share an almost otherworldly connection. But when the pair met one another before filming began, they immediately liked qualities in the other that would ultimately make their on screen connection that much stronger. For Englert, she jokes that it was the actor’s carefully-sculpted bed head.